Day 1 of Rail-Ex successfully completed. Last night, when I was supposed to be in bed, I decided to do the 'track cut and diode trick' to stop anything doing a high dive off the end of the layout. Moderately successful.... I miscalculated the momentum effect, and need to set the cuts back a bit. Small job before start of play in the morning. 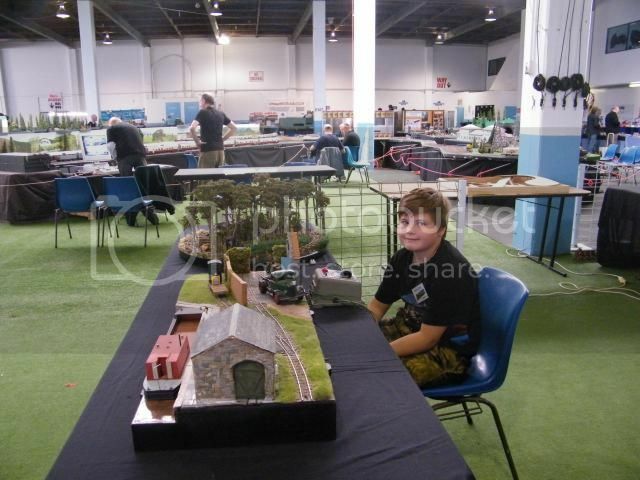 N2GS ready for start of play on day 2 of Rail-Ex 2014. A change of transformer/controller solved the 'overrun' problem we had yesterday, and respacing the diode gaps was not necessary. He ran Petherick Quay all day, without complaint... and proved to be a competent operator. Last edited by Gavin Sowry on Wed Nov 07, 2018 6:05 am, edited 1 time in total. Gavin Sowry wrote: I never really got around to finishing off my Bedford. But, I love the detail on the frame so much, I think it deserves showing.... so cab and chassis it will probably remain. 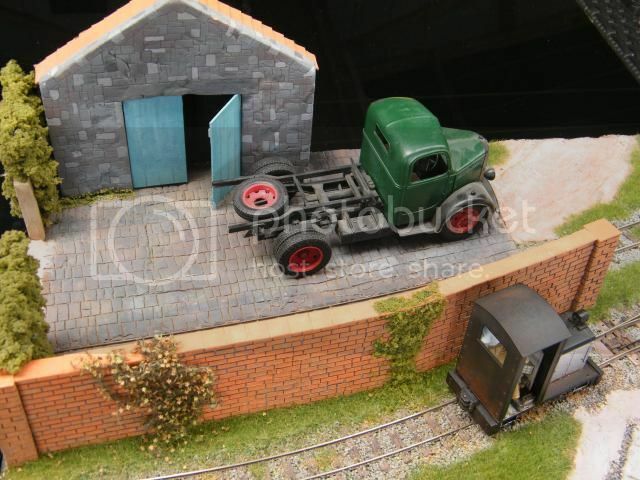 Fellow modellers agreed that 'cab and chassis' is the best way to display this vehicle. They too, loved the detail. Showing this weekend as Petherick Quay at Rail Ex 2017. Dusted off this evening, applied power, and she still works.... even the diode protected reversing sections. I've decided to finish off the extension piece that DCRfan started, and exhibit the Greater Petherick Quay layout at Rail-Ex 2018 in a month's time. Last edited by Gavin Sowry on Wed Nov 07, 2018 6:06 am, edited 1 time in total. Only then did I look back and realised it all began ten years ago. So I’ve forgiven myself. Always like this sort of thing, a point or two, some nice detail and a view blocker. Charming. Thought I'd posted this... must've hit the wrong button. Anyhow, now renamed Greater Petherick Quay.... because it is greater than what it was. Originally, the extension had a PECO OO turnout, yuk, so I replaced it with an On30 one to match the rest of the trackwork. spraycan nozzle gunked up, so that's something else to get. Skyboard is 'recycled' from one of my 25 year old layouts. Colour matching the paint was not a problem, it came from the same tin as was used for the first paint! Really makes a difference the sky backdrop, I was actually mulling over whether to carry on with the layout, but now I definately will. Last edited by Gavin Sowry on Mon Mar 11, 2019 7:14 pm, edited 1 time in total. That nice blue sky on the extension is just crying out for something to block part of it out. Few years ago, I invested some coin in some clapboard siding and window castings with the intention of building a church for my garden railway. But, it never got assembled. Full size it would be too big to go on this layout, so it is going to be half relief. One end wall sliced to produce two half end walls, a bit of bracing glued on..... now drying. Photos, and basic assembly later today when I get back from the hospital. Initial assembly, solid as a..... a church. Heck I leave the country for a few days and look what you get up to The improvements look great. DCRFAN 3 wrote: Heck I leave the country for a few days and look what you get up to The improvements look great. Looking even greater..... working on the porch for the chapel. So far, everything I've needed has been 'from stock', you know, the bits that will come in handy one day. I believe you are leaving the country, again, soon, I must find that inspirational ! Will we see it at Railex? DCRFAN 3 wrote: Will we see it at Railex? We will see it at Rail-Ex, will you? Porch added this evening. All set for a foundation ring, and roofing. Somehow, weatherboards 'buried' in the surrounding ground don't look right. I think it will be worth the effort. Bit of modelling time coming up.... Hospital tomorrow, then 'recovery'/modelling time. I'm back from Aussie on Saturday night so will come in to Railex on Sunday to see the church. Pre hospital status of the church. One more reinforcing brace to go on to set the rear wall of the porch, then it's foundation ring, and finally roof. Plan to have the foundation about a scale foot off the turf. Roof will be a 'solid rectangle of something', with a decorative veneer, be it lead, tiles, slate or iron. That will go on after the building is painted. Bracing is 12mm hardwood garden stakes, siding by NorthEastern, and windows/door by Grandt Line. Edging by Plastruct. Current idea is for imitation lead strip roof. Sheets look about 2 feet wide... any comments. ...and are they ribbed at the ends of the walls, or just finsh flat (or curled over). Sound simple, just lay down one big sheet of 'stuff', then glue on ribs of say stripwood or plastic... or is that too easy? No sooner than my 48 hours 'rest' post hospital experience, then into my modelling. Final brace attached.... doesn't look square, but it is. Mocked up the two rooves out of folded black photo album paper, just to 'look see'. Started to mow the lawn/cut the grass on Greater Petherick Quay, otherwise the church won't sit right. Hairdressing clippers do a good job (nearly got caught). Thinking next, maybe, of an Emmetesque station building to go on the siding, to cater for Sunday traffic ! More on the conservative side of things, though. A busy 'quiet' day (as in rest and recovery, along with light duties on Greater Petherick Quay). Backing board all marked out, so that notches can be cut to accomodate DCR patent switch rods. Jig saw still works, so they were cut out. Layout assembled, no problems. Attach backboard, basically one armed, achieved through the use of vice grips and a couple of chairs. Church foundations cut and glued into position. Painted an earth colour, then I found the concrete colour, which now adorns the cement work. Spots of scenery touched up. Church test fitted, then decided to rehang the porch door (it was sitting just too low enough to need a notch in the foundation). Found a good working can of matt black (which I thought I had, it was on the floor behind some tools), so the fascia of the layout became regulation colour. Spots of scenery touched up (overspray, you understand). Love it when things 'come together'. Hmmm... I think stained glass windows may be a good idea. Perhaps a bit Johann Sebastian's 'Tocatta' echoing in the chamber. A layout with potential, as they say. Actually, this is a bit of photography experimentation..... back to the 'old days' of manual focus, and Aperture priority (f22). Think it came out OK. Of course, there's been more work done in readyness for Rail-Ex..... the canal boat is finally moored to the Quay.